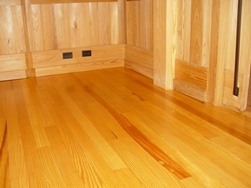 Southern Pine flooring is a durable, versatile and attractive addition to any home or building. Properly installed, high-quality Southern Pine flooring meets the challenges of the most demanding applications. Refer to the SFPA publication Southern Pine Flooring (download in Publications) for all the information needed to select, install, finish and maintain Southern Pine flooring. The complete step-by-step process of installing Southern Pine flooring over a concrete slab is presented in SFPA’s 16-minute video program; click here to view. Southern Pine double-beaded and V-groove patterns are classics for applications such as wainscoting and ceiling (interior and porch). Tongue-and-groove products are manufactured in a variety of grades. C&Btr and D grades are excellent for painting and staining. The No.2 grade offers an economical alternative, while providing a rustic look. Refer to SFPA’s publication Southern Pine Patterns (download in Publications) to review the various patterns available, plus finishing tips. 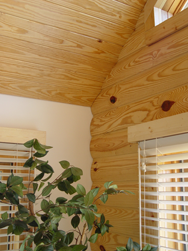 Southern Pine siding is manufactured in three types of patterns: bevel, drop and log cabin. It is generally sold in grades C&Btr, D and No.2. The physical properties of Southern Pine allow it to provide years of service and make it great for finishes and stains. Refer to SFPA’s publication Southern Pine Patterns (download in Publications) to review available patterns, plus installation and finishing tips. Southern Pine performs well in both impact bending and surface hardness, making it ideal for applications such as doors, windows and other mouldings. Its superior machinability, aesthetic appeal, competitive cost and wide availability make it a smart choice. Improved drying and conditioning techniques greatly enhance product stability.